Editor’s note: As has become apparent in this symposium, how individuals read The American Disease depends on when and where they first encountered the book. In today’s post, Caroline Jean Acker, author of Creating the American Junkie: Addiction Research in the Classic Era of Narcotic Control (2002) reflects on how The American Disease played in the social world of street-level drug education and ethnography in the late 1970s. On February 1, 1979, I walked into the office of Up Front Drug Information in Miami’s Coconut Grove, my first day on the job as Coordinator of the agency. Smaller and less well known than the Do It Now Foundation or the Student Association for the Study of Hallucinogens (STASH), Up Front shared these groups’ conviction that scare tactics did little to deter drug use once people found even one of their claims false. 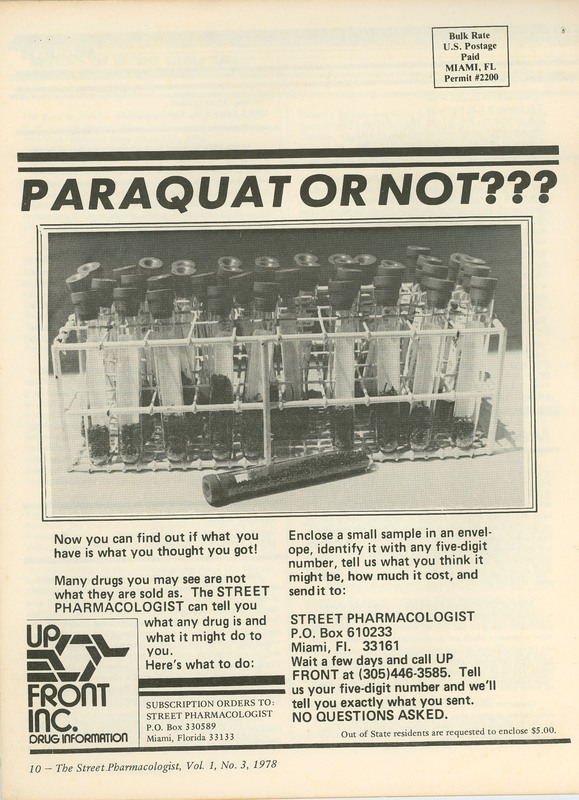 Up Front established a street drug testing lab in response to the concerns of American consumers that they might have purchased Mexican marijuana sprayed with the herbicide paraquat. Up Front’s logo (lower left) was a stylized mescaline molecule designed by Leon Rosenblatt. 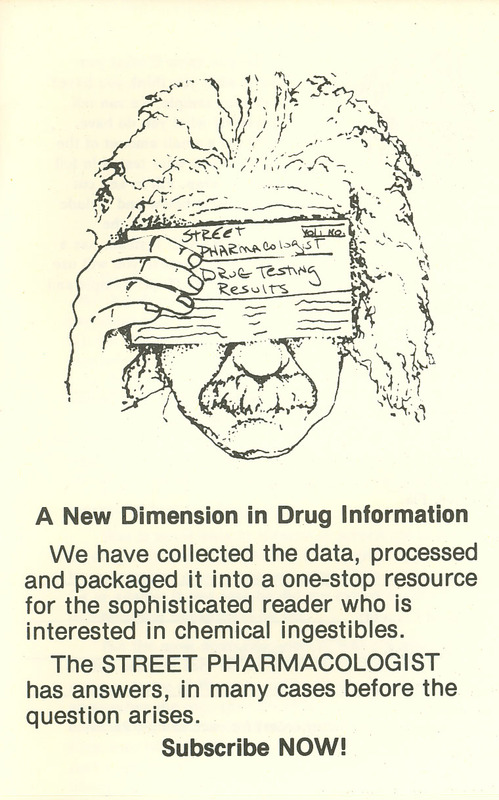 Founded in 1973 by Tracy Brown, Up Front assumed that if people were going to use psychoactive drugs, they would be less likely to experience undesirable effects if they had accurate information about them. Lacking clear understanding of drug effects, they risked overdose and other untoward outcomes. The organization maintained a small library (books ranged from Goodman and Gilman to Peter Stafford’s Psychedelics Encyclopedia; periodicals, from The New England Journal of Medicine to High Times), fielded questioners’ phone calls, developed and distributed pamphlets on drug effects and risks, managed a DEA-licensed anonymous street drug testing laboratory, and produced a small monthly magazine called Street Pharmacologist. My first published writing appeared in this venue where, as editor, I accepted my own submissions. When I was hired, I knew little about psychoactive drugs, and Tracy set about educating me before he went off to law school. 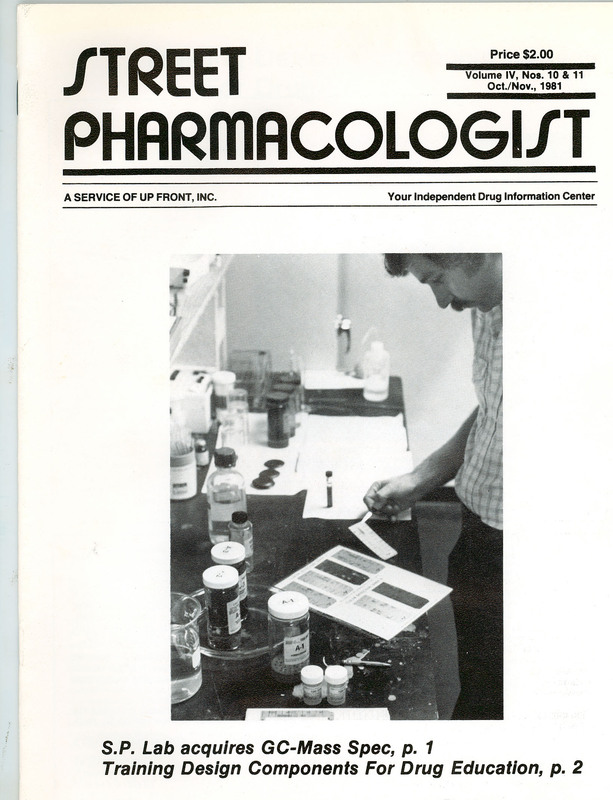 The cover of the Oct.-Nov., 1981, issue of The Street Pharmacologist shows a mass spectrometer operated by chemist Lee Hearn, who conducted Up Front’s street drug analyses. Hearn found out that any randomly selected $20 bill (at least in South Florida during the heyday of the cocaine cowboy) showed detectable traces of cocaine. The first book he put into my hands was David Musto’s The American Disease. Read this, he told me, and you’ll see where American drug policy came from. I devoured the book. The American Disease set my first context for thinking about Americans’ social and legal responses to psychoactive drugs. I read other books, such as Ed Brecher’s Licit and Illicit Drugs and Andrew Weil’s The Natural Mind. And I also found that Musto’s form of history had limits in its ability to help me understand the experience of drug users. But Up Front’s staff included, half time, an anthropologist, Patricia Cleckner (later, Patricia Morningstar), who had written a fieldwork-based dissertation for Cornell based on her experience of living in a therapeutic community in New York City. Her ethnographic work with different groups of drug users in Miami enabled deep insights that informed both the academic and activist aspects of my professional life. Some years and jobs later, I decided I must return to graduate school (I had left Stanford’s graduate program in history with a master’s in 1970). The question motivating my graduate school research emerged from my experience at Up Front. I had worked there from 1979 to 1982. During that time, I witnessed a debate over how best to define “addiction.” An older definition held that a drug was addictive if it produced both tolerance and a physiologically overt withdrawal syndrome. But a new definition was emerging during the years I worked at Up Front: one focused on drug users and one that included stimulants as well as depressants. This new definition (which I quickly came to call the Three C’s) held that Compulsive drug use which was out of Control and continued in spite of adverse Consequences constituted addiction. My dissertation research was driven by the question, where had that earlier definition come from? What emerged was a story of disciplinary silos. As reform-minded psychiatrists in the early 20th century established community clinics, insinuated themselves into the court system, and otherwise sought to influence broad areas of American life, so also they sought to explain addiction on the basis of character and behavior. Pharmacologists, in turn, put to the task of developing a nonaddicting analgesic to replace morphine, focused solely on measurable drug effects. Happily for their purpose, the physiologically overt withdrawal syndrome produced by opioid dependence proved quantifiable and a reliable test of addictiveness resulted. Less happily, one candidate drug after another which showed good analgesic strength also displayed problematic liability for addiction. From these two disciplines, psychiatry and pharmacology, arose a definition of addiction that included physiological aspects (tolerance; withdrawal) and characterological ones (heroin addicts, the focus of concern through the middle of the twentieth century, were liable to addiction because of fundamental defects of character). Finally, sociologists sought to understand addicts’ behavior as experienced by addicts themselves. Each of these disciplines turned its own eye on the phenomenon of addiction. As I worked on my dissertation, I would get to a place where, say, I wanted to characterize physicians’ ideas about addiction in the 1910s. Or, what about the maintenance clinics of the immediate post-Harrison years? Oh, no, how much time and research would this take? Not to worry: David Musto had done the work before me. This happened over and over again. I came to see that the first thing to do when I had such a question was to pull The American Disease off the shelf. The Elder David convened a second conference in 1998 to observe the 100th anniversary of Bayer’s introduction of heroin onto the market. (He approached Bayer for possible funding; unaccountably, Bayer declined!) This time, he included key scientists and policy makers from the Nixon years, including Jerome Jaffe, Egil Krogh, and Herbert Kleber, who gave a keynote speech at dinner. In organizing these conferences, the Elder David drew on his stellar reputation to secure the requisite funds from NIDA. Not only as a scholar, but also as a generous mentor and networker, David Musto left a profound and indelible mark on the still growing and ever more vibrant field of the history of drugs in America and the world. It occurs to me that readers of Points who did not know David Musto might be struck by the extent to which this series of posts on The American Disease has been so uniformly effusive in their praise for the scholar and his work. It isn’t that The American Disease was the last word in scholarship on drugs history–far from it. It was essentially the first word, a foundational work in the truest sense. Every one of the authors of this series departed from Musto’s analysis in at least some aspect of their own historical work, but what remains is this: David Musto was, a Caroline points out, the most generous of mentors. He (along with David Courtwright) set the tone for our field–a field which, to my mind, has remained incredibly open to and supportive of newer scholars, and remarkably free of petty turf wars. That’s not true in other fields, and it is perhaps David’s most important legacy. He is and will be missed. This Musto/drugs history symposium and, more immediately, Joe Spillane’s comment prompt me to think about parallels or lack of them in the alcohol/temperance history field. The latter seems more diffuse and less connected with medical and psychological researchers. What do others think? David, I think you’re right. I think this has something to do with just how solitary Musto’s work was in the field (for so long). That the alcohol/temperance field is less connected with medical and psychological researchers must be at least partly related to legal status, which has probably also stifled a lot of potentially productive inquiry into the cultures of drug consumption (never a problem in the alcohol field). That cigarette production chart on page 230 of Breecher’s book Licit and Illicit Drugs speaks volumes of the ‘war on drugs’ as cigarette mercantilism. Although I, too, had some problems with Musto’s argument about the cyclical/generational pattern of social reaction to drug use, I will say that anyone who helped nurture scholars like the wonderful, generous people I have met here is a great man. Caroline, I found this remembrance very moving, both in what it said about you and in what it said about David Musto. I’ll second your comments about Caroline’s post–a useful reminder that we could all use more of her work here at Points!